Ashlea McSweeney has had a long and successful career in Gymnastics. She has been a part of the Spring Hill/Premier family since 2005. As a former Spring Hill (now Premier) gymnast, Ashlea competed at a Regional, State and National level for Queensland. Ashlea reached the highest level in the National Level Program, Level 10. She competed Internationally for her club twice travelling to Hawaii and finishing her career competing in the USA. 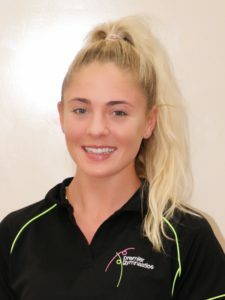 Ashlea moved straight from 20+ hours in the gym as an athlete to coach and her infectious bubbly personality was an instant hit with the children under her care. She now holds Advanced Coaching and Judging Accreditation’s. Ashlea’s passion for her sport and commitment to personal development makes her an asset to the Premier Team. Gymnastics is a huge part of her life and she say’s she wouldn’t have it any other way.